'All About Presentations' by Jazz Factory: How to create a Lunar Eclipse Effect in PowerPoint? How to create a Lunar Eclipse Effect in PowerPoint? PowerPoint is an amazing tool. It can do a lot more than what you think it can. There is nothing impossible with PowerPoint. If you have a crazy idea and you think you can't do it on PowerPoint or it is too complicated, think again. While playing with PowerPoint just a while back I got this weird idea. Can we create an Eclipse Effect in PowerPoint? 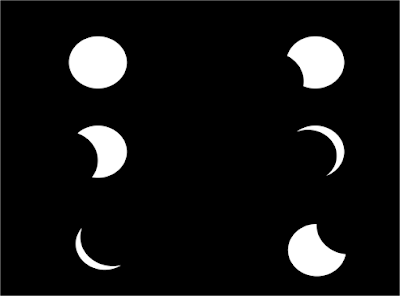 How do we re-create a total lunar eclipse where the Earth casts its shadow over the Moon and gradually eclipses it totally and then moves over. Read to find how to create this 'cool' trick in PowerPoint in just 5 minutes. You can also see screenshots in the presentation below to understand the steps better. For best results, view the presentation in full screen mode. Open a new file in PowerPoint. Right click on the slide panel (on the left) -> Under Layout, choose Office Theme 'Blank'. Now you have a blank slide with you. Go to Design -> Background Styles -> Choose a complete black slide. Alternatively, you can insert a rectangle in PowerPoint (from Insert Tab). Expand it to cover the slide and make it black. Insert -> Shapes -> Choose an Oval -> Draw a circle in the middle of the slide. Select the circle -> Go to Format Tab -> Enter 8 for Shape Height & Shape Width. This will make it a perfect circle with diameter 8 units. We need to visualize how Earth's shadow will move over the Moon, eclipse it fully (because it is an object of the same size) and then move across. Select Earth's shadow -> Animations ->Custom Animation -> Add Effect -> Motion Paths -> Draw Custom Path -> Line. Now click on the center of the Earth's shadow, drag the line diagonally up (top right of the slide). Try to pass the line approximately from the center of the Moon. If you have drawn the line well, then in slideshow mode you can see your animation. On one left click, your Earth's shadow will pass over the Moon and move across. But the speed is too fast. By default the speed chosen is Medium. Click on Earth's shadow -> Under Custom Animation panel on the right -> Under Speed -> Choose Very Slow. Now you can go to SlideShow mode (Shortcut: SHIFT+F5) and on one click the animation starts. Depending on your liking you can enter a speed higher or lower. In case you are not able to make the Earth's shadow cut the Moon fully, try this trick. Increase the shape height and width of Earth's shadow to 9 units. Then re-align the shape to the right-bottom of the slide. Now it will be easier for Earth's shadow to cut across (overlap) the Moon. Surprise your friends and colleagues with a 'home-made' eclipse.